In 2012 Tyron established her own non-profit, One of the Tribe, establishing partnerships with U.S. based Amazon Watch, Fundación Pachamama and Creative Visions. Tyron also serves as an Ambassador for Amazon Watch and Fundación Pachamama. The rare exclusiveness, for those who can afford it, is not lost on the elite, rather it is marketedContact with the Earth’s last remaining and most isolated Indigenous peoples must be considered an extraordinary privilege. One could argue that for the elite few who experience such a rare “encounter,” there is little to differentiate between this encounter and most all other colonial conquests in Earth’s history. The rare exclusiveness, for those who can afford it, is not lost on the elite, rather it is marketed: “We will have the rare privilege of interacting with the Achuar People in the early stages of their contact with the modern world.” [Source] The exclusivity and desire of the Euro-American elite is heightened with the understanding that they are among the chosen few to experience, perhaps for the last time, what little remains of pristine nature and Indigenous cultures. The very same pristine nature and Indigenous cultures the West has been destroying for centuries via predatory industrialization and the rabid genocide of Indigenous peoples. Such tourists, having just stepped into the Anthropocene, comprise the very, very few who will encounter the exotic and bear witness to the living vanishing prior to planetary ecological collapse. Not unlike witnessing the last rhino on Earth or any other last remaining species to walk the planet – this “rare privilege” of interaction must be considered one of many ultimate accomplishments for the bourgeoisie’s own personal “bucket list.” The more rare the spectacle, the higher the cost, the more coveted the experience becomes. As citizens who were spoon-fed the myth of American exceptionalism, it seems likely that collectively, we as Euro-Americans have become so desperate to escape ourselves, we now find ourselves attempting to latch onto Earth’s last authentic living/breathing cultures. Simply for no other reason than we can no longer tolerate who we have become. The atrocities committed in our names have become far too egregious for any respectable citizen to further hide behind a feigned ignorance and blindness. Thus, starved for true meaning, the “otherness” of Earth’s living ecosystems and authentic Indigenous cultures is not internalized or understood – rather, it is voraciously consumed. It is critical to note that interaction between foreign women and local men has been known (and documented) to cause community conflicts (Tapuy, 1996). One can safely assume bikini-clad foreign women being guided in canoes (by Achuar men) for leisure creates such conflict (and most likely intense jealousy) considering it has been documented that valuable time spent away from families and family responsibilities causes stress and conflict amongst many of the Achuar families/communities. Further, it has been documented that the Achuar are very jealous people, which is said to be a common trait in their culture. To understand the emotions that such selfish actions will undoubtedly evoke, yet still choose to fulfill one’s own personal wants and interests, is beyond the pale. Of course one does not have to read hundreds of papers via academia (another sector targeted and utilized by foundations/oligarchs) in an attempt to understand how members of isolated tribes might actually feel as fetishized “subjects” of fascination by the middle/upper class, predominantly white tourist. In some rare instances, the “subjects” speak for themselves with their thoughts, insights and feelings, unedited – shared by way of film. Such is the case in the understated masterpiece “Cannibal Tours” in which the interview of a village elder by the name of Camillus is woven throughout the film. Director Dennis O’Rourke (now deceased) communicates the commodification of human interactions (and relations) by simply filming people in their natural state. The raw honesty captured, in particular the thoughts of Camillus (unknown – 1987), is so tender and veracious, the film is almost unbearable to watch. Feelings of confusion, discontent and frustration as felt by the local native people are transparent; the superiority and ignorance of the tourist, demonstrated in effortless candour, is ugly and biting. Although the documentary is filmed in Sepik River in Papua New Guinea (released in 1988), almost 30 years later we can recognize parallels. Note the scrappy Coca-Cola truck situated in the village (27:20). Just as Coca-Cola, having conquered the globe, has ventured into isolated jungles in the quest to unearth new untapped markets (as market share must grow indefinitely), industrialized/globalized and parasitic capitalism, having also conquered the globe, must also find new markets. As a response to this predatory economic system, we witness the targeting and sophisticated seduction of the last peoples remaining in isolation – within pristine natural settings, ripe for commodification. 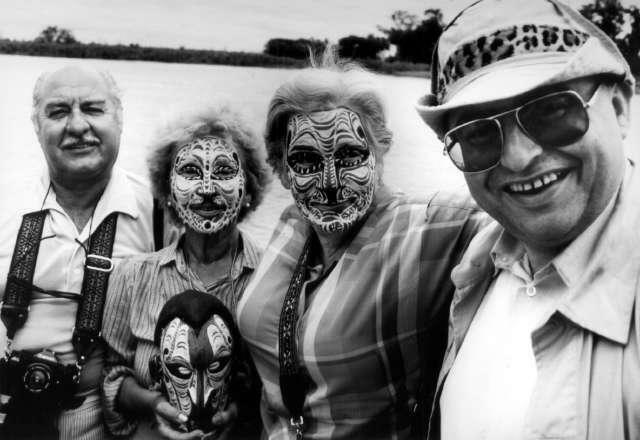 Note the face-painting (formerly reserved for traditional ceremonies), turned into a marketing component and an exotic novelty for the Euro-American tourist. Today, Indigenous peoples are rapidly abandoning their enviable subsistence economies – in exchange for impromptu, makeshift markets on the airstrips as the wealthy tourists descend. In a desperate attempt to sell their wares, they are in pursuit of the greenback – the greenback, backed by nothing. One could argue that since the filming of this documentary, the Euro-American has become more enlightened, with ecotourism NGOs and managers more cognitive of “politically incorrect” behaviour. Yet New York Times art critic Ken Johnson disagreed with such an assumption. Johnson once stated that if Voltaire were still around to tell the story of globalization, two of his principal character types would be “the enlightened, transnational citizen of the world and his imbecilic twin, the tourist.” It is crystal clear which character type the movie Cannibal Tours captures, yet what is not clear is the fact that under the system of industrialized capitalism, in tandem with Western ideologies of privilege and consumerism sweeping the globe, the choice of which type of traveller one wishes to emulate has already been decided. In other words, evidence suggests that today, many formerly isolated Indigenous have learned (taught via the Euro-American) to successfully exploit the West’s idea/stereotype of the “ecologically noble savage” and effectively manipulate the tourists thereby fulfilling the exact function of branding and marketing agencies. In effect, the ecologically noble savage persona/stereotype is a growing commodity created specifically for foreign consumption, via ecotourism. According to a World Bank resource document (written by Nature Conservancy in partnership with USAID), the Kapawi development commenced with a stunning initial investment of USD $1.8 million by USAID. While the document states clearly that “logging, oil exploitation and intensive agricultural projects had not been developed in the area when the Kapawi project was initiated in 1994 (Koupermann, 1997),” it is also quite clear from existing documents that many Achuar were convinced/came to believe that the ecolodge was the only way forward if the tribes were to resist oil development from destroying their communities. 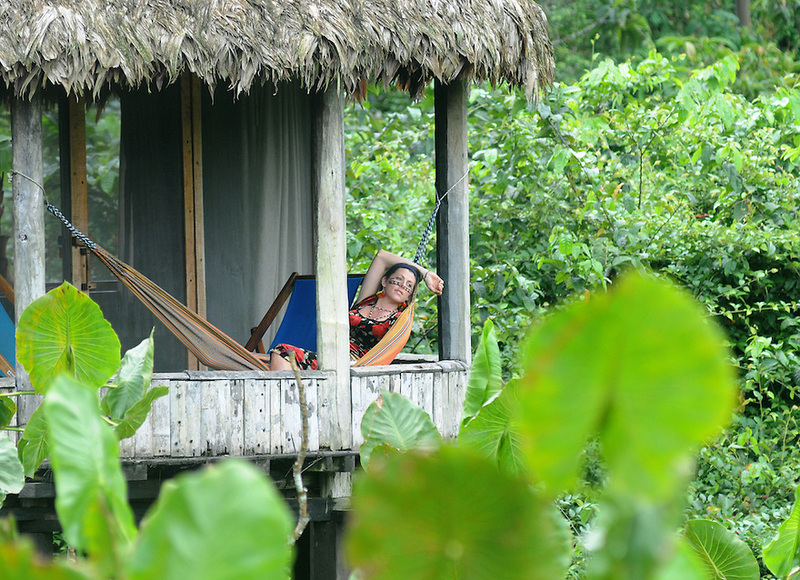 There is no doubt that the descriptive and emotive text coupled with the sensual, prototypical rainforest imagery (utilized to “sell” Kapawi) conveys to the audience that it is only by way of ecotourism, and ecotourism alone, that the Achuar can continue their mission of conservation. This is in stark contrast to the fact that the Achuar practised truly sustainable conservation for centuries before colonization began only decades ago. This constructed message is also in stark contrast to the fact that tourism has greatly contributed to and continues to exacerbate an ever accelerating planetary climate crisis. The Kapawi development appears to have transitioned from a Western-perceived independence and freedom, to a global and very real indebtedness, liability and perpetual servitude. Considering that the results mirror our very own entrapment within the industrialized capitalist system, it is safe to assume that this was the plan from inception. It is publicly stated of the Kapawi development that “the initiative’s board is composed of five people – representatives of Achuar com­munities both from the province of Pastaza and from the province of Motona Santiago, and a President of the Achuar Nation of Ecuador (NAE) – all of whom are Achuar. The board meets every six months to carry out an analysis of the project.” [Dec 20, 2012] However, again, the reality appears to be somewhat different. Analytica is an investment bank in Ecuador specializing in debt restructuring, research, mergers and acquisitions, and trading. Analytica also sponsors a university in Quito, Universitas Equatorialis, offering degrees in environmental engineering, with Fundación Natura, the local chapter of the World Wildlife Fund. The amount of debt that Kapawi has incurred (so it appears) could be staggering even by Western standards. Consider that Pachamama administers Aerotsentsak, the airline corporation created, operated and eventually to be owned by FINAE. The costs associated with maintaining an airport, airplanes and an airstrip, even if small, must be intense. What of the original loan ($1.9 million) by USAID? What of the money invested by Conodros Tourism Corporation? What of the 3.5 million euros allocated by the German Bank for Reconstruction (KfW)? Was this withdrawn as initially agreed upon when the project was “given” fully to the Achuar approximately four years ahead of schedule? [“After this period, Canodros will withdraw all investment and the Achuar will manage the entire operation.”][Source] As part of the contract that would allow Canodros to transfer full ownership to the Achuar four years earlier than originally agreed upon, Conodros agreed to create a two-year trust fund and pay for extensive upgrades/renovations. That Conodros would invest a further substantial amount of money in Kapawi – in order to terminate a contract – suggests that ending the partnership, even at a significant cost, was still a far better business transaction than maintaining the contract for four more years. It would appear that, tragically, the Achuar Indigenous peoples (among countless other Indigenous communities no doubt), in good faith yet via coercion, have inadvertently subjected themselves to loss of full control over their territories. One must contemplate how these massive bank loans are secured, considering the only asset (albeit most valuable) the Achuar could offer as guarantee would be pristine rainforest/land. Through heavy debt and financial obligations and a relatively new, strategically developed dependence on the global economy (via the necessity for an infinite stream of wealthy foreign tourists), Indigenous communities now participate in the continued colonization, or in the case of REDD (the UN’s Reducing Emissions from Deforestation and Forest Degradation program), the neocolonialization of Indigenous resources and people. Although it is said (by NGOs and foundation-financed academia) that eco-tourism projects such as Kapawi were conceived as a means to employ the Achuar and to provide revenue to combat the pressures of multinational corporations, one must wonder how this would in fact keep the multinationals at bay, then, or today. Of course, NGOs were not about to say back then what they will not say today nor will say in the future: that the key reason for involvement is ultimate control of the land and soft-power colonization of the people with their integration into the industrialized capitalist system. Like the multinationals, corporate NGOs also froth at the mouth over the prospect of exploiting these same territories – the NGOs financed by the very same multinationals, via tax-exempt foundations. Like circling vultures, the rapacious capitalists – even the self-proclaimed “compassionate capitalists” – leave no stones unturned. As discussed prior, if those in power of vulnerable states do not walk the delicate tightrope of somewhat satisfying the insatiable system, they will soon face the consequences of the West taking what they will not give willingly. Nature finds herself surrounded by predatory capitalist pathology. Consider that if on average there are 1,000 visitors at Kapawi per annum (a number cited in several documents), at an average rate of US$3,000 per tourist, this equates to a revenue stream of $3 million per year. Now consider there is no mortgage, no property tax, no utility bills. One must contemplate why there is no profit. After lawyers, consultants, auditing technologies, eco-services, audits, environ­mental impact assessments, marketing agencies, advertising, tourist agencies, teachers, biologists, experts, accountants, engineers, travel expenses, one must contemplate how much of this income finds its way back to imperial states versus how much remains in the community. The answer is likely a reprehensible one that few wish to acknowledge. Considering that foundations such as Rockefeller et al strategize for the protection/expansion of hegemonic power decades in advance, one could reasonably hypothesize that community-based ecotourism was developed and incremented as a deliberate stop-gap measure to control rainforests (via said protection) until a solid economic system/infrastructure for the commodification of all nature was firmly in place. Although such a theory may seem a bit far-fetched, it is not inconceivable considering foundations and “think-tanks” lead in the intense study of, and shaping of, behavioural change. The time involved in commercializing all aspects of society until saturation was achieved amongst the populace (ensuring tomorrow’s “consumers” would submissively acquiesce to an ideology of mass-commodification and privatization) would have been well-understood by foundations and think-tanks alike. Considering the 21st century explosion of land grabs, in tandem with the race to privatize and commodify the Earth’s remaining commons with little focus remaining on ecotourism, such a theory is deserving of further investigation. Further, the Achuar’s neighbours to the north, the Targaretti tribes (in the central Ecuadorian rainforest) have managed to stay isolated from industrialized “civilization” (industrialized civilization being the most uncivilized way of living that has ever existed). The Targaretti are the last tribes in Ecuador to refuse contact with Western civilisation and continue to live a traditional and nomadic way of life. One could argue that this tribe has no means of protecting/obtaining legal claim to their ancestral lands (because they have no monetary means of obtaining legal representation, etc.) and that this fact leaves them in a most precarious position, unable to defend themselves against the bulldozers and oil companies who are now encroaching upon their lands. Yet, the simple truth of the matter is that the Targaretti peoples fully understand what privileged Euro-Americans collectively refuse to acknowledge: the state only fears what it cannot control. Maintenance of the 800-metre airstrip through manual labour (“work that never ends”). Health: In case of emergency, such as a bad case of malaria, funds are offered, 50% as a loan, and 50% as a donation. Education: $80 per month. The School of Ecotourism in the community of Kapawi can be reached in 50 minutes by canoe from the lodge. They use funds to buy books, pay teachers, and for transportation. [It is not clear who the teachers (teaching tourism) actually are. It is unlikely that the teachers are Achuar.] In this document, Cristina Serrano of Canodros Tourism is cited as the leader/representative of the Ecotourism School.